Thirty-eight civil society groups and political parties have urged the Hong Kong government to withdraw a national anthem bill, arguing that it violates citizens’ rights to fundamental freedoms. “The National Anthem Law imposes an ideology on Hong Kong citizens by requiring them to respect the national anthem to an extent that will ‘promote patriotism; and to cultivate and practice the core values of socialism.’ This clearly violates freedom of thought,” the groups said in a joint statement issued Tuesday. The statement came two months after the government submitted to the legislature the outline of a bill criminalising “insults” to the Chinese national anthem. The proposal came after China’s top legislature passed a similar national law and included it in Annex III of the Basic Law. The bill says that anyone who sings the national anthem in a derogatory manner will face up to three years in prison. It also requires primary and secondary schools to teach students the “history and spirit” of the song. They criticised the “vague” statutory language for potentially subjecting Hongkongers to subjective enforcement and violating the right to freedom from arbitrary arrest guaranteed by the Basic Law and international human rights laws. “Given the hefty criminal penalty, including criminal conviction and potentially even imprisonment, to which an offender may be liable, the proposed law can in no way be called proportionate,” the groups said. They also expressed concern that the current proposal – which would criminalise works deriving from the national anthem – may suppress the freedom of creation. One well-known example is a viral video with the Cantonese lyrics “arise, I’ll take you to travel around the world. I’m riding Godzilla, mom says I’m truly perverted” set to the tune of the anthem. They added that school curricula have always been decided by teachers rather than by statutory prescriptions. The curriculum of the Moral and Civic Education subject, they said, already contains guidelines on teaching the lyrics and history of national anthem. The groups urged the government to withdraw the current proposal and consult the Hong Kong public on the bill before tabling a new one. 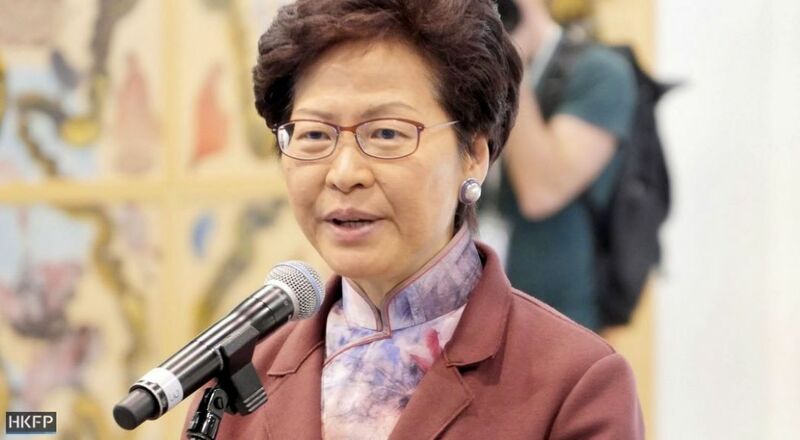 Chief Executive Carrie Lam said in March that there was no need to hold public consultations, saying that authorities will take into account public opinion throughout the legislative process. She also asked the public not to be “oversensitive,” as the government does not intend to punish Hongkongers but to ensure that they will respect and identify with the national anthem, HK01 reported at the time. Earlier this month, student leader Cheung Sin-ying of the Federation of Students attracted criticism from Hong Kong’s pro-Beijing camp after she said during a public hearing at the legislature that she “wants to vomit” whenever she hears the national anthem. Chinese state media branded her as part of Hong Kong’s pro-independence force, which they described as the “enemy of the people.” Cheung said she received many hostile messages on Facebook following news coverage of her remarks. The groups expect the first reading of the bill to take place in July.